Day 1 - Welcome to Wellington. Day 2 - Wellington Your Way. Day 3 - Wellington to Hawke's Bay. Accommodation: Porters Boutique Hotel, Havelock North, Hawke's Bay. Day 4 - Exploring Napier. Day 5 - Geothermal Rotorua. Day 6 - The Sights of Rotorua. Day 7 - Footwhistle Cave and Auckland. Accommodation: Sofitel Auckland Viaduct Harbour. Day 8 - Auckland to Bay of Islands. 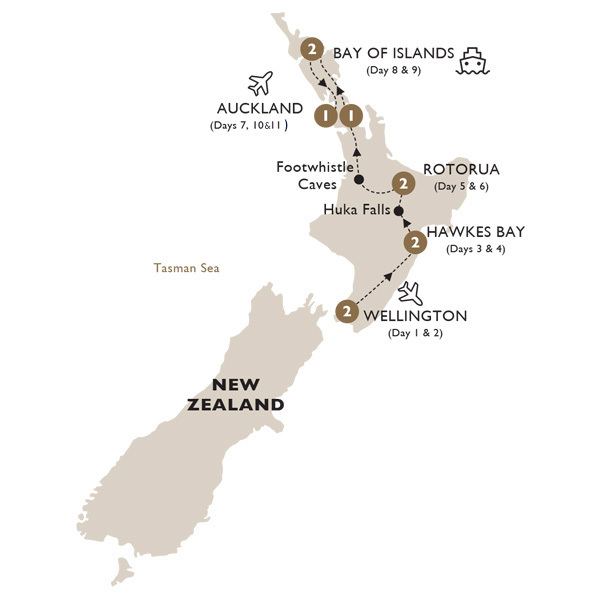 Accommodation: Copthorne Hotel & Resort Bay of Islands. Day 9 - Bay of Islands at Your Leisure. Day 10 - Cruise the Bay of Islands and onto Auckland. Day 11 - Farewell Auckland. Rotorua: Gather round for a feast of succulent meats and vegetables, cooked in a Hāngi and prepared using the traditional Māori method of cooking over geothermal steam coming from the earth. Dining Summary: 10 Breakfasts (B) and 6 Dinners with Wine (DW). Wellington: Explore Wellington Your Way with a choice of visiting Weta Cave, home of the creative wizards behind The Lord of the Rings and The Hobbit trilogies, joining a local guide for a city walking tour around Wellington or a guided visit to Te Papa, New Zealand’s incredible national museum and art gallery. Rotorua: Visit the Whakarewarewa Living Village and gain an insight into the lives of the Māori community and their special bond with this ancient land.